China is home to some of the large solar farms in the world. The total installed solar capacity is 130 GW in China. It is said that this capacity could power all of the UK alone. China is the leading manufacturer of solar panels with more than 60% of the world’s installed solar capacity being made in the country. Presently, China generates one-third of its total power requirement from renewable sources of energy. In fact, China met its 2020 target well within the timeframe i.e. three years earlier. 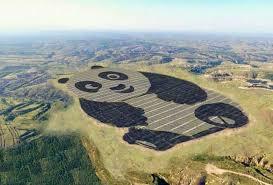 China’s two giant panda solar farms are made up of thousands of solar panels. Another large solar farm in China is a huge 850 MW Longyangxia Dam facility on the Tibetan Plateau, comprised of four million panels. Another solar farm is 1500 MW in size. Needless to say is the fact that these huge sized solar farms occupy a large amount of space and are hence built several miles away from the main cities. One of the major problems of this set up is that the power cannot be supplied as efficiently and quickly to the nearby cities as is needed. Most of the people in China live on the eastern side, while the majority of Chinese solar farms are built on the western part of the country. This means that the solar power generated from these farms needs to be transported to reach its ultimate destination. China has one of the lowest capacity factors in the world. The capacity factor is the difference between installed capacity and the actual output that is obtained from renewable energy systems. One of the major factors influencing the capacity factor is the location and weather of the place. Part of the energy generated at the farms also gets lost during transmission. Though China is building high efficiency better transmission line technology, it will still take time for completion. China has revolutionized the solar technology and has quickly made a strong mark in the world market. The country, however, is facing a demand slowdown as China cuts major solar subsidies for big solar park installations. As such, industry players are suggesting building rooftop solar plants in China to be a more lucrative option.